AlphaNinja - Interesting deal here. I own shares of Dell (DELL), and am neither thrilled nor too dismayed with this morning's announcement that they're buying outsourcing firm Perot Systems (PER) for $4billion. Dell shares are down 4.5% today - partly down with the general market, and partly due to the rich price paid for Perot. The cash offer of $30 per share is a HUGE premium to Friday's closing price of 17.91. Congrats to Perot shareholders, who're clearly big winners in this deal. This acquisition helps Dell expand further into the services segments, especially where Perot is big in healthcare and government. Dell's $9billion cash hoard is one of the major reasons to own the stock. That said, the cash needs to be put to better use than earning palrty interest with rates as low as they are. Figure the $4billion used for this deal earned 2% or $80million in interest. Well now they just bought Perot, and the company's $200million in possible Free Cash Flow is a much higher 5% yield on that cash. "why does acquiring a company with $300million in operating costs enable you to cut $300million in operating costs?" 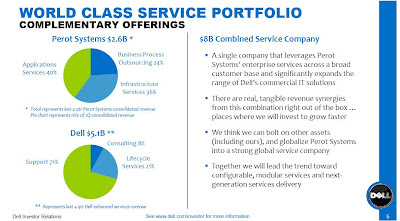 Dell's response was that there's plenty of room elsewhere (besides Perot's $300million in operating costs) to save money, such as combining data centers and improving delivery of services. Another analyst on the call mentioned Dell's previous intent to acquire a company with higher margins than itself. The issue here is that EVERYBODY has higher margins than Dell! Perot's gross margin is about 17%, and operating margin about 7% - still higher than Dell. I also am skeptical of the cost savings Dell claims they'll find. At the end of the day however, this business is higher-margin than Dell's, and it gives them an entry point to sell their own products to a wider customer base. The $4billion spent will earn a higher return than it would in cash. This is not a home-run deal, but the way I see it Dell is a more valuable company than they were Friday.